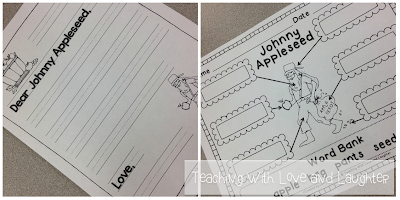 Teaching With Love and Laughter: Fun, no prep, Johnny Appleseed Craft! Did you ever see a great idea on someone's blog and you knew right away that you HAVE to do it in your own classroom? 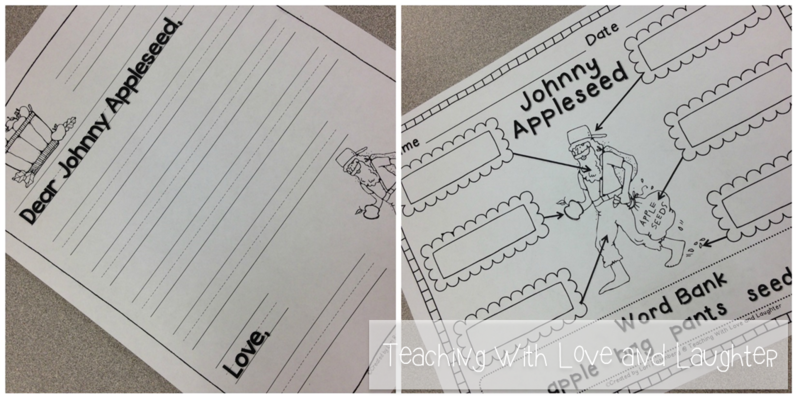 Well, as soon as I saw this adorable Johnny Appleseed craft here, it was love at first sight. I knew my students would enjoy making these and I was right. They were so engaged, you could have heard a pin drop in my classroom. First, I showed my students step-by-step how to draw Johnny. Kerri includes these directions on her blog. Everyone's came out different and we all enjoyed watching Johnny appear on our papers, little by little. My favorite part about this whole activity, was there were no tracers. 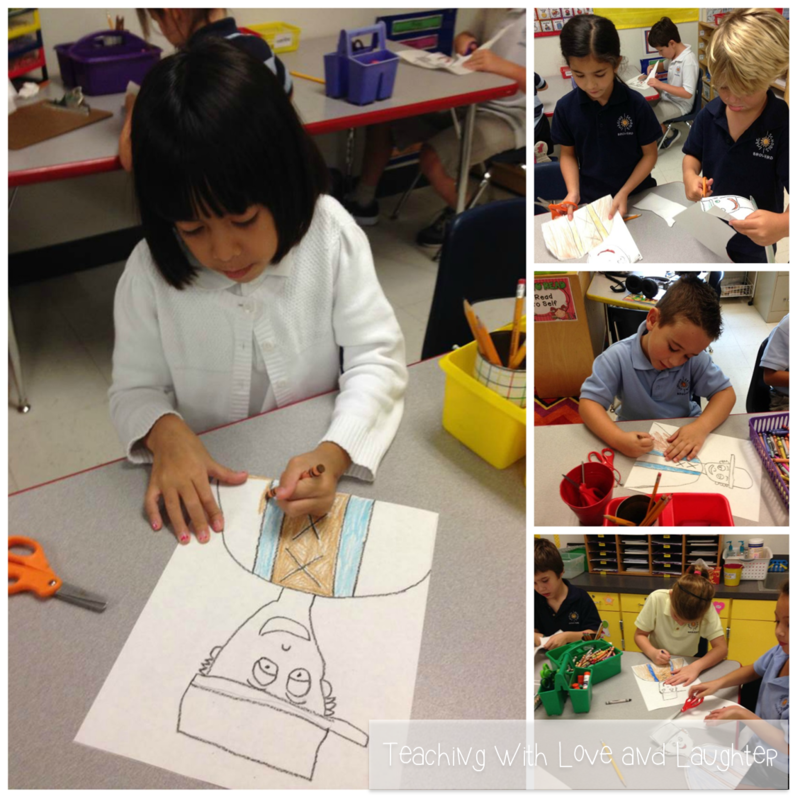 The children drew their own Johnnys and cut out their own trees, grass, and suns. Thank you so much, Kerri, for this fabulous idea! These activities are all in my Work on Writing Activity box. My students can select any activity that interests them. 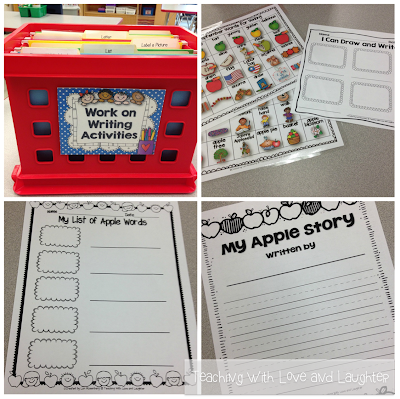 These apple related activities are part of my Writing Right Through August and September pack. Soon, I'll exchange them with my Writing Right Through October and November activities. And so on, and so on... I love knowing that my Work on Writing Station is planned for the whole school year! Sorry I don't have any completed activities to show off you yet. 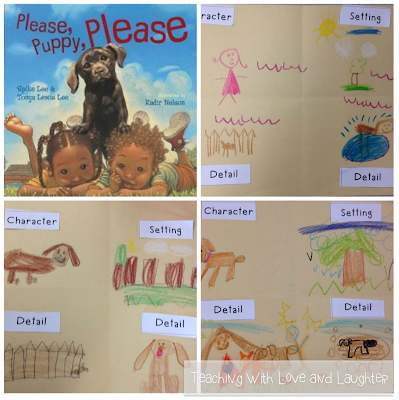 In other news, my kindergarten students have really been enjoying the story Please, Puppy, Please, written by Spike Lee and his wife. It's about two little kids who have some fun with a naughty little pup. It's a great story to use when discussing story structure. 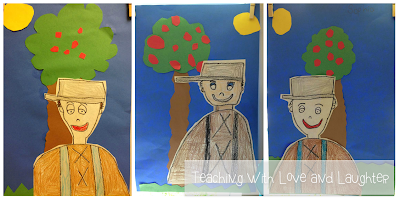 Here's a fun activity they completed. 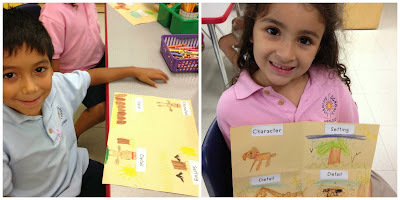 After teaching my students about characters, setting, and details, the children folded a piece of paper in fourths, and drew a picture of each in the four squares. This was a fun, interactive way, to reinforce story structure, and challenge them to be creative. We were all thoroughly happy with our final product. Even me! Yes, I made one too! Just click the image above to get a copy of the words. Are you using Journeys for LA? We are doing Please, Puppy, Please next week, thanks for the idea! I am! If you email me, I'll give you the strips I made. One less thing for you to prepare! Thanks so much for sharing the Johnny Appleseed craft you discovered! Our art program was cut this year, and I've been a bit worried about picking up the slack. This was perfect. We had so much fun and created some fab artwork. 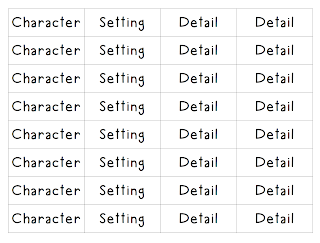 I love the character, setting, detail, detail sheets. What a great idea! I love your blog! I teach in Broward and use Journeys also. 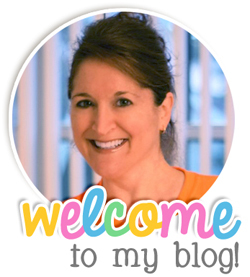 Your blog and TPT store is so helpful. Thanks so much. :) I'm using this next week.